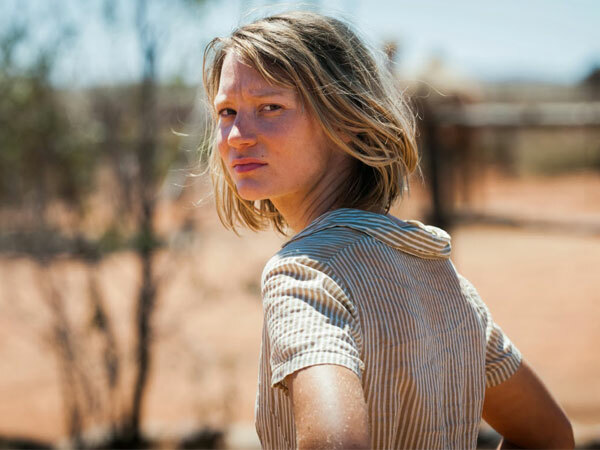 Mia Wasikowska shows off her tough, gritty side and natural Australian accent in Tracks, John Curran’s (The Painted Veil, We Don’t Live Here Anymore) atmospheric new drama. His film depicts the real-life tale of Robyn Davidson’s (Wasikowska) 2700 kilometre journey from Alice Springs, at the outskirts of Australia’s desert to the Indian Ocean accompanied only by four camels and a dog. It was a trip that made Davidson a celebrity and transformed her career into an award-winning journalist. In order to finance her expedition, which ultimately took seven months, Davidson agreed to be the subject of a pictorial article in National Geographic. While she was technically alone in Australia’s desert, one of the magazine’s photographers, Rick Smolan, was contracted to meet her en route several times and capture what she was doing pictorially. She also found an aboriginal elder, Mr. Eddie, who guided her through many kilos of sacred grounds at a mid-point in her trip. None of this mitigates the harshness of Davidson’s circumstances in the desert, or the immenseness of the trek. Curran’s film emphasizes the intensity of the heat and the winds in the desert. Wasikowska is fine throughout, using her face to capture a stoicism and willingness to endure physical and emotional privation that she’s only unleashed before, to this extent, in Jane Eyre. Curran’s direction emphasizes Davidson’s intense interest and fondness for camels and love of her black dog, Diggity. Wasikowska, who is expert on playing with silence in her roles, is able to convincingly show Davidson’s impatience with people—even her sister, best friend and Smolan, who eventually becomes her lover. The film is weakest when depicting Smolan, who is treated as both a rank outsider, inappropriately using his camera to get the best storyline for National Geographic and also a person who can be attractive to Davidson. Curran and his scriptwriter Marion Nelson, also attempt to justify Davidson’s journey through flashbacks to the harrowing period when, as an 11-year-old, she has come to terms with her mother’s suicide. In some cases, less is more, and it would have been better to leave Davidson’s story as an enigmatic one. After all, men have adventures; why shouldn’t women? Tracks is a unique film and a worthy adaptation of Davidson’s book. Not for everyone but it certainly will attract a niche audience.